So, you want to build a team. Welcome to our ropes challenge course guide. Machovec.com carries many ropes suitable for building your own challenge course. We look forward to serving you, answering your questions and helping you develop your own ropes program. If you cannot find an answer here, do not hesitate to Email or call Jay @ 763-263-9835 to get the information you require. 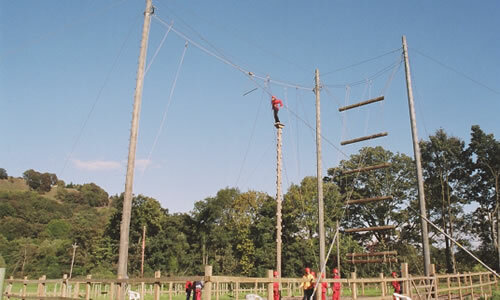 A ropes course is a unique and powerful way to foster team and personal development through mental, physical and emotional challenges. It gives everyone the opportunity to participate regardless of physical ability or athletic experience. The higher the risk, the higher the reward. The beauty of rope courses are that all the risks are perceived, and the rewards are very real. The high ropes course is characterized by heart pounding, adrenaline rushing, palms sweating "perceived high risk" activities. The activities may include any number of events that require participants to work through their fears and anxieties, to function in a challenging alien environment. Click here for more information on high rope challenge courses. The low ropes course is characterized by it's ability to create the need for group members to challenge their old ways of thinking and acting. The goal of the low course elements is to have participants unite and function as a high level group. Click here for more information on low rope challenge courses. Pole based courses can be a visually stunning addition to existing facilities and combine the very best of traditional rope courses with the latest pole technology. A pole course can be expanded, with each additional pole adding up to 4 new elements. Tree based courses remain popular for those with access to suitable woodland. Trees have some advantages. They are cost effective and can create and atmospheric environment around the element. Of course, not all trees are suitable - they are not always just where you want them!